I was craving for KBL (Kadyos, Langka, Baboy) but no access to Kadyos so Red Beans to the rescue and it turned out really good. Give it a try. Using a pressure cooker (saves a lot of time) boil pork hocks in 10 cups of water till fully cooked. 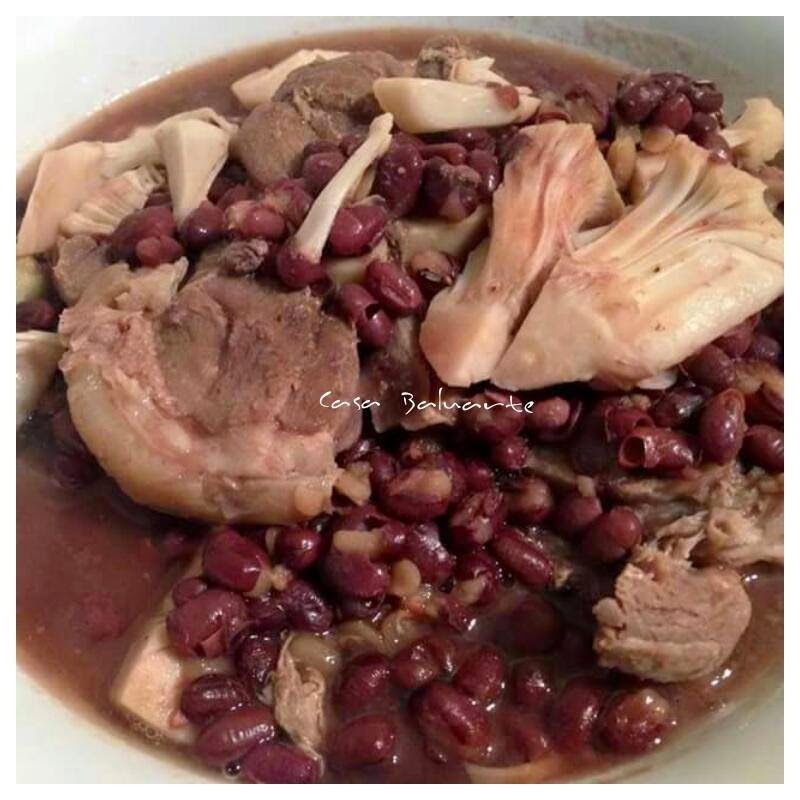 Once the beans is almost fully cooked add the slices of onion and langka to the pot. Simmer for few minutes till the langka is fully cooked. Add the cooked pork, season with sinigang mix, salt and ground pepper. Simmer for few more minutes, remove from heat and serve. 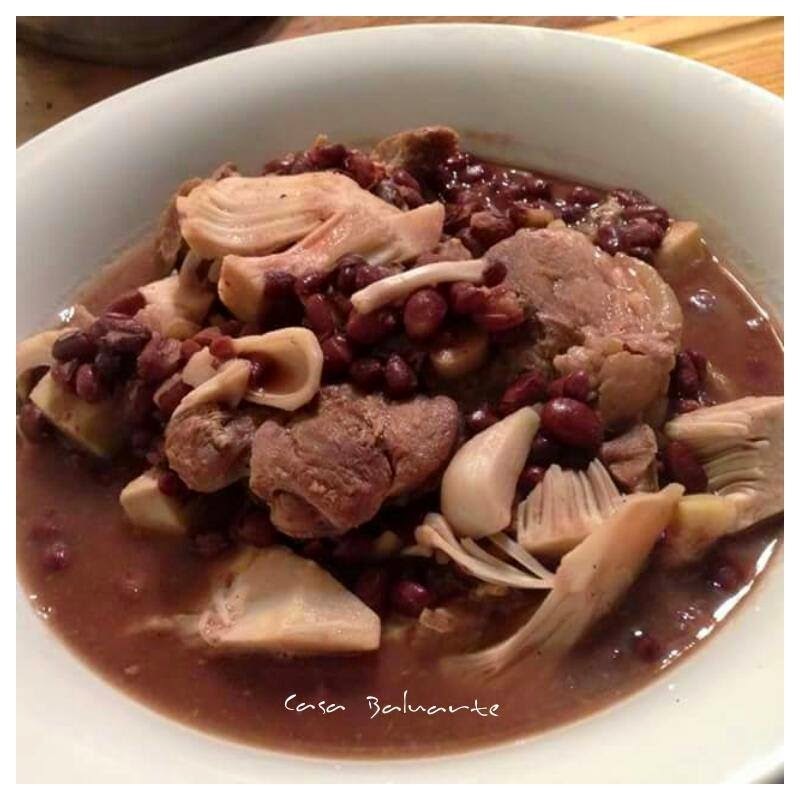 Can I use the canned red beans ? It wont be as tasty as boiling some red beans then. This is a brand (Goya) of the dried beige variety of kadyós (pigeon pea) sold in the Hispanic grocery store: http://foodies.blogs.starnewsonline.com/files/2014/02/0212foodies1ps-565x422.jpg. It's delicious for making KBL. In Spanish, "kadyós" (pigeon pea) is known as "gandúles". If you can't find kadyós/pigeon pea (Cajanus cajan) seeds in Asian grocery stores, you could try looking for kadyós seeds in Hispanic grocery stores. The beige variety of dried kadyós seeds is sold in Hispanic grocery stores kag kadyós pa gid ang sabór kag textúra. In Spanish, kadyós is known as "gandúles". If you reside in a warm climate and have a garden, you could try planting some dried kadyós seeds that were soaked overnight in a cup or bowl of lukewarm water. Kadyós grows well in the warm southern areas of the USA (Hawaii, Florida, Puerto Rico, Guam, Mariana Islands, and from North Carolina to southern California). Kadyós also grows well in the tropical and subtropical Top-End of Australia. Filipinos and other tropical Asians can also find beef liver, beef tongue, beef bone marrow, oxtails, chorízo, longanísa, lechón, lechón sa kawáli, chicharrónes, lechón manók, pig's blood and pig's intestines (for making dinuguán), tripe (for making káre-káre), tilápia, tamáles, empanádas, camóte tubers, gábi tubers, the white interior variety of úbi tubers, ripe family-size papáyas, green family-size papáyas (for cooking), kalabása, sayóte, sabá, plantains, Cavendish bananas, mature coconut fruits, young coconut fruits, coconut water/juice, Manila mangoes, mango juice, avocados, guavas, tamarind fruits, sweet peppers, hot peppers, leche flan, dried atswétes seeds, dried bay leaves, cassava tubers, etc., in Hispanic grocery stores. The flavor of Mexican dessert breads is similar to that of Philippine dessert breads. If there is no Filipino store available, Filipinos or other tropical Asians might be able to find all the ingredients they are looking for in American grocery stores, Asian grocery stores, Hispanic grocery stores, or local/nearby farmers' markets. Singkamás tubers can be found in Hispanic grocery stores. Some individuals make another version of "Kadyós, Báboy, kag Langkâ" (KBL) by using only ripe tomatoes as the souring agent instead of using batwán (Garcinia binucao/morella) or sinigáng mix. Some individuals use batwán when tomatoes are unavailable. In my humble opinion, the most delicious version of KBL is "Kadyós, Báboy, kag Rímas" (KBR). Some individuals regard unripe rímas (seedless breadfruit - Artocarpus altilis) as more delicious than unripe langkâ (jackfruit - Artocarpus heterophyllus). Although, langkâ is generally more versatile than rímas. Unripe kamansî (seedy breadfruit. - Artocarpus camansi) and unripe antipólo (in Tagalog)/tipoló (in Western Visayas) (Artocarpus blancoi) are sometimes used as a substitute for langkâ when making KBL. My favorite version of KBL is "Kadyós, Útok (beef bone marrow), kag Rímas" (KUR), "Kadyós, Útok, kag Kalabása (kabocha squash)" (KUK), and "Kadyós, Útok, kag Kapáyas (green unripe family-size papaya)" (KUK). Kadyós/pigeon pea (Cajanus cajan) is easy to grow in a warm climate. Kadyós is a hardy, drought-tolerant legume. Kadyós can even grow semi-wild or wild. Kadyós grows to be a small tree that lives up to five years. Four kadyós trees can produce enough kadyós seeds per year to feed a family of four. Also delicious: "Kadyós, Manók, kag Kapáyas"; "Kadyós, Panít (tuna), kag Kalabása (kabocha squash or butternut squash)"; "Kadyós, Panít, kag Kapáyas"; "Kadyós, Mackerel, kag Kalabása"; "Kadyós, Mackerel, kag Kapáyas"; "Kadyós, Líson, kag Kalabása"; "Kadyós, Líson, kag Kapáyas"; "Kadyós, Mamsà, kag Kalabása"; and "Kadyós, Mamsà, kag Kapáyas". Some individuals place plenty of balúnggay (Moringa oleifera) leaves to cook on top of their version(s) of KBL.